Any visualization or verbalisation is undesirable in its practice. Due to this neutrality, the technique is very popular and widespread throughout the world. Vipassana is sometimes practiced also by the Hindus. It is generally known that the relationship between Buddhism and Hinduism is very close with many intersections; perhaps the most important one is Buddha as a human being, God’s enlightenment on earth that is (for the Hindu people) connected to Vishnu and Shiva. Although I myself had the opportunity to try out various types of meditation in the past few years and went through a ten-day Vipassana course, though not in Bali, I gained a new insight at meditation as such after an interview with the Meditasi Bungalows owner Wayan Kanta, who sometimes calls himself Smiling Buddha (which is also the name given to his restaurant). In his temple in the resort garden there are two altars: one for Saraswati (the goddess of knowledge, wisdom, art and music), the other one for Gayatri, the Gayatri Mantra (a very important Rigveda mantra) embodiment, the wife of Shiva in the highest form – Sadasiva. Wayan (this is perhaps the most traditional Balinese name) used to have long hair and look like a hippie before his spiritual healing gift was revealed to him. He loves to laugh and says he lives his life on the borderline between yoga of mind and rock’n’roll. Since early morning he practices Raja Yoga and meditation, prays regularly and acts as a healer, but by 20:30 he turns to a man who likes to have a drink and a cigarette and enjoys chilling out on the beach or in his restaurant . As most locals, he cannot swim but adores when his guests have fun, dance, sing, play the guitar and at the end of the „party“ run into the dark sea for a night swim. Wayan has three dots on the wall in his temple where he also practises healing on anyone in need, for free. They are placed at the eye level (for a person of my height, cca 165 cm) when seated in the meditation position. The technique through which Wayan teaches meditation is similar to Tratak, well known to all yogis as this is one of the cleansing techniques. Basically, we watch a candle flame carefully and diligently, trying not to blink. But the candle flame moves a bit, and it also drops down as the candle burns. That’s why Wayan uses those dots and teaches his students not to blink for ten minutes. First, it’s very difficult, but if you manage this “mind over matter” technique and you do not blink, the dot suddenly disappears and after about two weeks of regular practice, a stunning result arrives. Wayan was aware of his ability to heal as a child. He first healed his friend about twenty years ago. It was more like an experiment, and paradoxically, the friend first struggled when Wayan put his hands on her, but then, after a half hour, she said that the trouble was completely over. At that time, Wayan was worrying about his abilities, as most people who have a specific spiritual gift do, before they understand and decide how to work with it. As Wayan says, everyone has his guru somewhere, who will appear at the right time. Thanks to his Master, who simply came around one day, Wayan began to heal himself first (any healer must start with himself or herself) and healed the migraines that he suffered from at that time of his life (they appeared also due to his life style: he lost a lot of money, even a family house, in the cockfights). And then he met the Grand Master, the main master who is nicknamed QRAK (he had some healing sessions in the Czech Republic too and some videos about him can be, though rarely, found on Youtube). Wayan narrated to me how he saw QRAK for the first time in Denpasar, where he healed 500 people. ORAK asked his assistants to give each patient who gathered in the designated spot a paper onto which everyone had to write their first name, surname and telephone number. A bunch of papers was assembled in front of QRAK and he laid his hand on the pile for a few minutes. People in the hall began to cry, vomit, and shiver. Within minutes, all was over. Relief came and people left. Wayan said that at moment he understood and believed and began his two-year training to become a healer. Today he cures in his temple, every night at 7:30 pm. He treats anyone who comes and seeks help. The results are really good, although not always 100%. Wayan needs three treatment sessions in a row, and the patient has to follow some basic rules (like taking a shower before, not after the healing and some other basic things). Wayan heals through the help of water. Water is generally very important for Hindu people. Before entering a temple, they receive a blessing with the holy water, after prayers one can ask for holy water too. 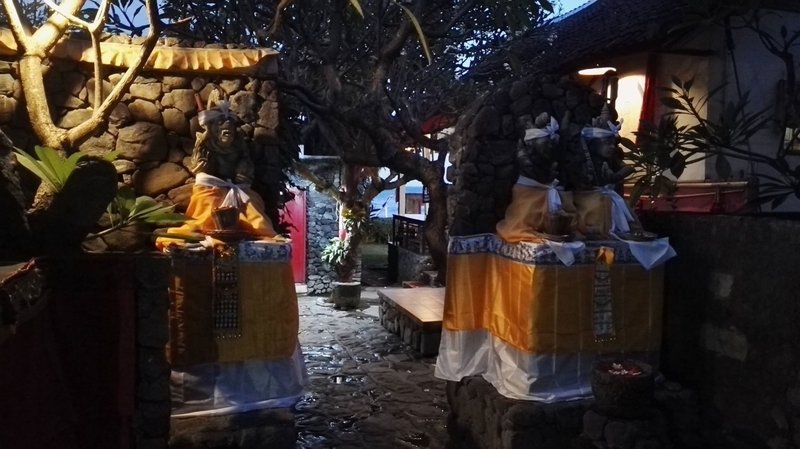 In Wayan´s temple, there is a water fountain which helps Waan concentrate and connect. He would always bring in fragrant sticks to ask the goddesses for help. During the prayer, the patient concentrates on their health issue and in their mind name the problem. Wayan and the patient then sit opposite each other and Wayan puts his hands over the places where the trouble is located. He puts sacred oil on the spot. Subsequently, Wayan pours holy water into the patient´s palms and they need to put it on the crown of their head three times, wash their face with it (also three times) and drink it (again thrice). 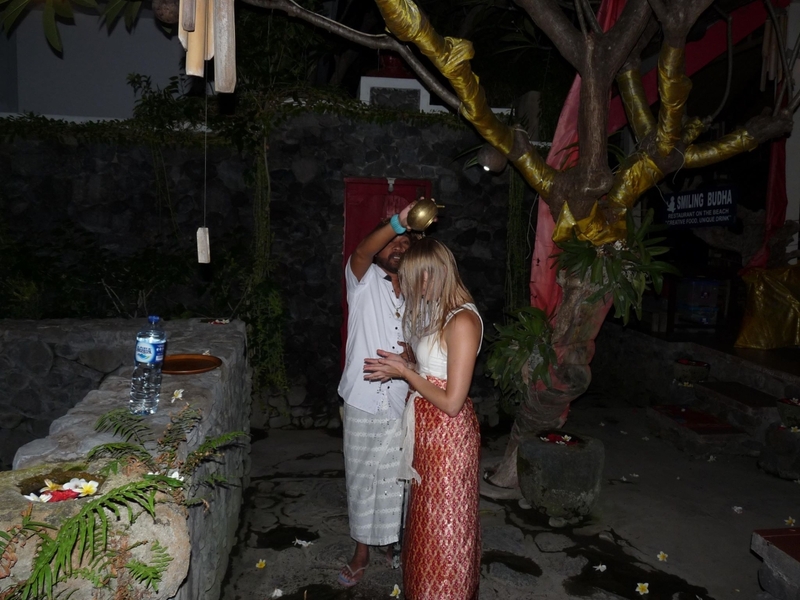 After leaving the temple, Wayan pours holy water all over the patient, who can then leave to get changer. That night before bedtime and the next morning after awakening, a patient needs to reapply holy water they received onto the crown chakra, the face, and drink it. Every procedure must be repeated thrice again. Whatever you think about this thing, it does not harm to try it out. The results are surprisingly good sometimes. And a healing session somewhere has almost become a “regular package deal” for tourist holidays here. In an case, the island of Bali offers much more than what our senses could perceive. At night, you can watch Venus and the Milky Way and listen to the wave whispers that awaken something long forgotten somewhere in the depths of your soul. This place truly IS exceptional.